1893 – Birth of Alexander Mikhailovich Pishvanov, Russian World War I flying ace, engineer at Sikorsky Aircraft Corp. and Seversky Aircraft. 1908 – Louis Blériot, in a Blériot VIII, flew a distance of 4.3 miles. 1942 – On a flight from Hawaii to Canton Island, a Boeing B-17D Flying Fortress, carrying top-scoring U.S. World War I ace Eddie Rickenbacker on a tour of U.S. Pacific bases, strays hundreds of miles off course due to faulty navigational equipment and ditches in the Pacific Ocean due to fuel exhaustion. All seven men aboard get into life rafts and remain adrift for 22 days before being rescued. 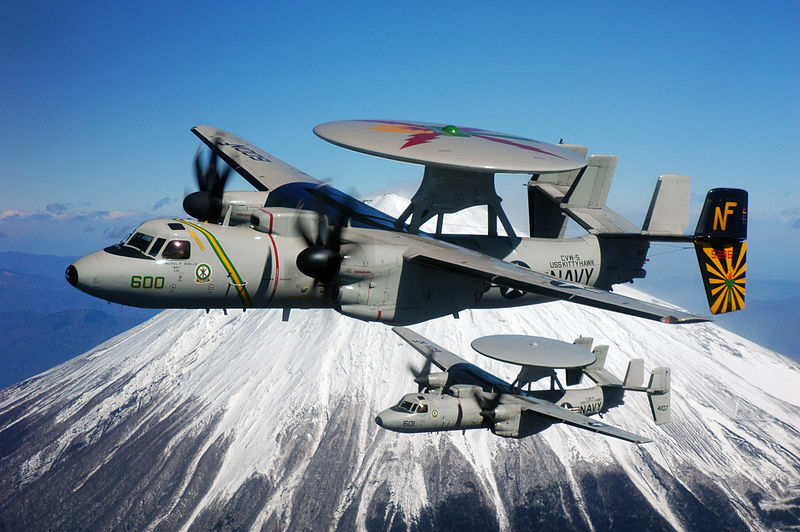 1960 – First flight of the Grumman E-2 Hawkeye (shown above), an American carrier-capable tactical airborne early warning (AEW) aircraft. 1973 – The Militky MBE1 becomes the first electrically-powered piloted airplane to fly; designed by German engineer Fred Militky, it is propelled by an electric motor and four rechargeable batteries. 2012 – Death of William Louis Buchanan Walker, British World War II fighter pilot and poet; he was the oldest surviving pilot from the Battle of Britain.